Previous Story: How Business Is Done? "How do I properly cook spicy basmati rice to unleash its flavor, taste and superior look, Ma?" asked Hosh. "Most rice is quick and easy to cook," said Isha. "But Basmati cooks best as separate fluffy aromatic grains." "It has naturally long, thin, pointed white grains, but is a lot more expensive than other rice varieties." "Still, if you can afford it, its flavor, presentation and superior taste are worth paying extra for. If you can't afford it, try Jasmine instead, although that is a bit sweeter." "Let me teach you the simple, yet delicious Jira Rice today, so we can continue working with ingredients you already know about." "It’s easier to measure rice by volume and not by weight," she told him, "because you can use the same cup to measure water. I take two cups of water for each cup of rice. This ratio has never failed me in the past. Roughly 50 ml rice per person is a good guide." "I've found it best to cook rice in a deep pot with a lid, but I've seen a frying pan used in some videos. Perhaps in the belief that the shallower the rice is spread out during cooking, the better it is in the end." "Rice expands when cooked, so in any case choose a pot that accommodates for its eventual rise." She made him repeatedly wash rice in running water until the cleansing water was clear. They left the cleaned rice in a sieve, to rinse the water completely. While rice was drying, Isha asked Hosh to heat oil in the pot. They added cumin seeds and cloves to the oil. "You can also add some diced onions at this stage," said Isha, "and cook them till they turn golden brown for extra flavor, but you don't need to, as rice cooks beautifully just in plain water too." “These are added to the rice as a very fine powder, which sticks to the rice. Reportedly, rinsing removes these. This isn't a big deal if you have a balanced diet, but if you want to receive these vitamins from your rice, don't rinse." "I grew up rinsing my rice, so cleaning it myself makes me feel more confident that I am working with a clean product." "However, rinsing and local rice enrichment policies might be worth investigating further, if you are keen and want to be absolutely sure. I didn't bother, as I couldn't tell the difference between rinsed and non-rinsed rice." Isha was happy to see that Hosh fried the cumin seeds for a couple of minutes until they had started crackling and their aroma had started coming out. They added the rice and salt now, and stirred well. "Turn the grains over in the pot," she instructed, "until they are nicely coated and glistening with oil. This helps to keep the grains separate." Now they added warm water, stirred again once, and put the lid back on. "Don't keep stirring after the warm water has been added," she tipped. "You don't want to break the delicate grains as they boil. Breaking them releases their starch and produces sticky rice, defeating the purpose of having paid more for them to stand out individually." "You can stir once every five minutes, if you really want to, but I don't stir at all while they are cooking." "Delia Online suggests using stock instead of water, where rice is to be served with chicken (use chicken stock), beef (use beef stock), or fish (use fish stock). But it doesn't recommend using stock cubes, as they can overpower the natural aroma and flavor of basmati." "How long will it take to cook, Ma?" asked Hosh. "And how will I know when they are done?" "It should take 15-20 minutes to cook on medium heat," Isha answered, “and you'll know they're done when you lift the lid and see holes in the rice, as no water would be visible on top. That's when you remove it from the heat." "Another way to test, is to tilt the pot. If water collects at the edge, give it a couple more minutes." 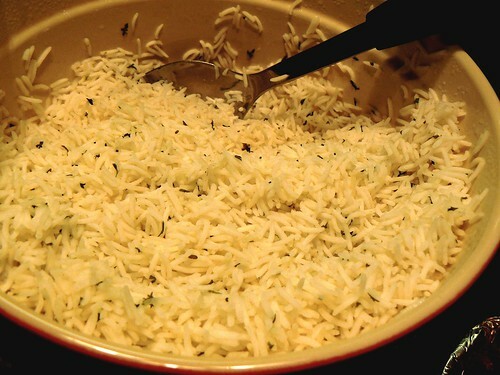 “When rice is cooked, leave it for a few minutes in the pot with the lid on, before serving. This will help it soak up the water and any gumminess at the bottom of the pot. Rice will separate individually as it dries and cools." "Rice can also be cooked on the lowest heat setting, but it would take longer to cook. I do that when I have other things to attend to, while I am cooking." "You can leave it alone once the lid is on. Lifting the lid and letting the steam out can slow down the cooking process. I don't generally recommend it, as rice should ideally be cooked as briefly as possible. Overcooking spoils all rice types." "You can also set the timer and go away, if you are using a rice cooker "
"If you haven't used Basmati, remove the lid once the rice is cooked. Turn off the heat and cover the pot with a clean tea towel for a few minutes. This absorbs the extra steam and helps keep the grains dry and separate. Just before serving, lightly spread and rake up the grains for presentation."